If you have been following my blog for a while now, you might have picked up that I like the change management author Rick Maurer. He writes in a simplistic and humoristic way about the sometimes serious topic of change. 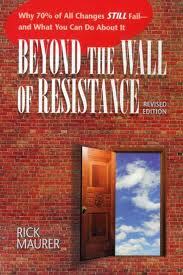 I’ve used his 3 level resistance model from his book ‘Beyond the wall of resistance’ to map key stakeholders up to the most senior level in efforts to understand and drive S&OP change. Level 1: I don’t get it: this involves facts, figures and ideas to understand. It’s the world of thinking and rational action. It is the world of presentations, diagrams, processes and logical arguments. Level 2: I don’t like it: this is an emotional reaction to the change. It is based on fear. People are afraid that this change will cause them to lose face, status, control, maybe even their jobs. Level 3: I don’t like you: maybe they do like you, but they don’t trust or have confidence in your leadership to make this work. I used his model in my S&OP change efforts, but maybe the biggest learning I got out of his books is to not fight resistance. Instead embrace it, dance with it and turn it in to your advantage when you can. After applying the model for a while I realized there is a group of people that didn’t really fit in on of the three buckets. When I looked backwards in all the large companies I worked for, I realized I had seen this same reason for resistance; a lack of focus or attention due to competing priorities. Large companies are not very good in driving a manageable set of business priorities. What they usually end up with in the board room is an impossible long list of priority projects. In this environment, sometimes people don’t seem to like your change effort. But if you dig deeper it shows that they actually like the change, they get it as well, but they can’t spend enough time on it. I put them in Level 4: I like it…but. These people don’t mind the change, sometimes even want to lead in the change, but can’t spend enough time on it due to competing priorities forced upon them. This group requires another change effort then when people genuinely don’t like your change effort. When I addressed this in an email to Mr Maurer, he was ‘delighted’ that I tweaked his model. In fact he mentioned that his mentor Edwin Nevis told him; ‘it’s the only way the theory grows’. Now I had to Google who Edwin Nevis is, but basically this is the guy that realised that a hierarchy of need is culturally relative, where Maslow’s based his on the American culture. Not a bad mentor to have! So it became that an international respected author of multiple books on change management, was ‘delighted’ to get my feedback on a change model he has been developing, using and teaching over the years. Someone who is willing to be flexible and adapt his thoughts with the learning’s from a person who is unknown to him and resides on the other side of the world. Maybe the real lesson here is to stay humble as a (thought) leader, even in your own area of expertise.